We are excited to be a part of this multi-farm CSA! Diverse Maine grown food delivered to your workplace or community space throughout the year from a collective of small family farms in your community. CSA shares available Weekly or Bi-weekly. Streamlined pay-as-you go online credit card system. 3 to 4lbs of basic cuts may includes beef, pork, chicken, or lamb. Market style bouquet delivered weekly. Food for the soul! THREE SIZES OF VEGGIES SHARES: We will be growing a significant number of these veggies along with other farmers in our Alliance. DELIVERY SITES: Delivery sites at the Urban Farm Fermentory and Woodfords Church, as well as delivering to a variety of offices and community spaces in Portland. We will also have a new pick up site in Belfast and near the farm. Have a office that might want a delivery share? We have greater reach in our share distribution in this new partnership, so share delivery is not limited to Portland. Are you located off the 295 corridor between Waterville and Portland? Have 10 or more interested in shares? Contact us about setting up a delivery site at your office or community space. WEEKLY NEWSLETTER: with news from the participating farms, recipes and local food news. SHAREHOLDER EVENTS: at participating farms or in Portland. 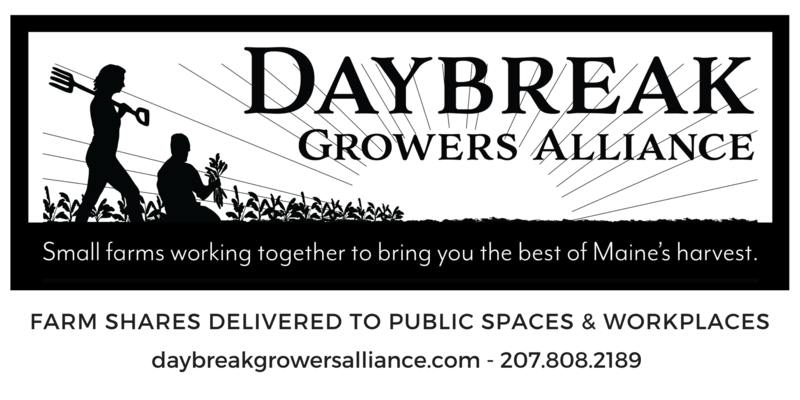 Contact us at farmers@daybreakgrowersalliance.com or 207-620-0540 with any questions.